What better setting to talk about property taxes than in a place that processes them? Senator Charles Schumer held a press conference at the offices of Town of Hempstead Receiver of Taxes Donald X. Clavin on Feb. 1. The ranking Democrat in the Senate and local officials were united in opposing a part of the new federal tax law. It would cap state and local tax (SALT) deductions from federal tax returns beginning with the 2018 tax year to $10,000. Clerks were busy taking payments from taxpayers as the senator, along with Clavin, Nassau County Executive Laura Curran, Town of Hempstead Supervisor Laura Gillen and Town of Hempstead Councilwoman Erin King Sweeney, bemoaned the consequences of the recently passed law on Long Islanders and their fellow New Yorkers. “No place in America was hurt more than Long Island,” by the changes, Schumer said at the conference. “We all felt awful—Democrats and Republicans, myself and Congressman [Peter] King (R-Seaford)—when the [new law] eliminated the ability to deduct property taxes” from one’s federal tax return. According to figures supplied by Schumer, more than 100,000 Long Islanders prepaid their property taxes for 2018 in the nine days after President Trump signed the tax overhaul into law and before the cap took effect on Jan. 1. Many offices of receivers of taxes stayed open late to accommodate the residents. He noted the 43,000 people in his jurisdiction who pre-paid, the vast majority coming in person to stand on lines stretching outside the building, in oft freezing weather. Gillen praised the work of Clavin and his department in handling the influx of residents in the final week of the year. 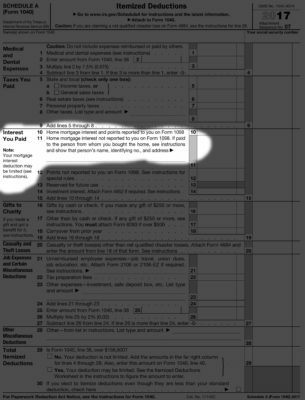 The relevant section of IRS form 1040 (Schedule A), on which taxpayers can list their itemized deductions. According to a press release, “During the three-week period as Republicans rushed through a partisan anti-middle class and anti-New York tax bill, Schumer loudly and staunchly opposed the first proposed elimination, and then cap, of the state and local tax deductions, also known as SALT. While the state and local deduction cap, Section 11042 of the legislation, explicitly prohibits 2018 state and local income taxes from being prepaid and deducted from federal income taxes in 2017, it does not include language on the prepayment and deduction of property taxes. This may be because this section of the partisan legislation was a last minute addition—hastily written behind closed doors. As the press conference wound down, Schumer announced that he had a flight to catch. “I’m going to get on a plane to Washington to make this fight,” the Senate minority leader declared. I write to urge the Internal Revenue Service’s (IRS) to revise its recent guidance [IR-2017-210] on December 27 suggesting that property taxes paid in the calendar year 2017 would not be deductible against federal income taxes in the year they were paid. Long Island and New York taxpayers are confused about this hastily written tax law and need clarity, consistent with the law, on provisions that may cause them to see a tax hike. The IRS should rescind their recent guidance, which is not supported by the law, and clarify that taxpayers are allowed to deduct their prepaid 2018 property taxes to state and local governments for tax year 2017. As you know, Section 11042 of P.L. 115-97 imposed a cap on the deduction of state and local taxes for the first time in the history of our country. This provision was agreed to last minute in a secretive partisan conference agreement. It will cause many New Yorkers and taxpayers across the country to see a tax hike. In order to lessen the damage of this provision, thousands of New Yorkers prepaid their property taxes for 2018 in the nine days after the tax bill was enacted and before the effective date of the state and local tax cap on January 1, 2018. These New Yorkers–and tens-of-thousands of Long Islanders–prepaid their 2018 state and local property taxes with the understanding that they could deduct these property taxes from their federal taxes in 2017, before the new cap was imposed on state and local tax deductions. Many state and local government did not have time in these nine days, which fell in the middle of a holiday break for many, to react to this new law and accept prepaid property taxes. However, certain states governor’s, including New York’s, moved with haste to issue executive orders authorizing local governments to accept prepayments. These efforts were made with a fair interpretation of the new law which has been challenged by the IRS’s recent guidance. The legislative text does not support the IRS’s December 27 guidance suggesting that property taxes paid in the calendar year 2017 would not be deductible against federal income taxes in the year they were paid. While Section 11042 explicitly prohibits 2018 state and local income taxes from being prepaid and deducted from federal income taxes in 2017, it does not include language on the prepayment and deduction of property taxes. 26 U.S.C. 164(a) outlines that state and local personal property taxes that were “paid or accrued” shall be allowed as a deduction for the taxable year. The new tax law does not change this. The exclusion of property taxes may or may not have been intentional given the secretive and rushed process that this legislation underwent to become law. Nevertheless, the legislative text does not prohibit the deduction of prepaid 2018 state and local property taxes accrued in 2017. Again, I urge IRS to rescind their recent guidance, which is not supported by the law, and clarify that taxpayers are allowed to deduct their prepaid 2018 property taxes to state and local governments in 2017, independent of whether they were assessed in 2017.